2. I know the state of our economy is a source of concern for many. This has been further worsened by the unbridled corruption and security challenges we have faced in the last few years. From those who have lost their jobs, to those young people who have never had a job, to the people in the North East whose families and businesses were destroyed by insurgents, this has been a difficult period in our nation’s history, lessons that we must not forget or ignore, as we plan for the future. 3. By June 2014, oil prices averaged $112 per barrel. But as at today, the price is under $39 per barrel. This huge decline is having a painful effect on our economy. Consumption has declined at all levels. In both the private and public sectors, employers have struggled to meet their salary and other employee related obligations. The small business owners and traders have been particularly hard hit by this state of affairs. 4. Fellow Nigerians, the confidence of many might be shaken. However, I stand before you today promising that we will secure our country, rebuild our economy, and make the Federal Republic of Nigeria stronger than it has ever been. 5. The answers to our problems are not beyond us. They exist on our farmlands; our corporations; in the universities in the hearts and minds of our entrepreneurs; through the gallantry of our Armed Forces; and the resolute spirit of Nigerians, especially the youth, who have refused to give up despite all the obstacles confronting them. development; delivering inclusive growth; and prioritizing the welfare of Nigerians. We believe that this budget, while helping industry, commerce and investment to pick up, will as a matter of urgency, address the immediate problems of youth unemployment and the terrible living conditions of the extremely poor and vulnerable Nigerians. 7. In the medium to longer term, we remain committed to economic diversification through import substitution and export promotion. This will build resilience in our economy. It will guarantee that the problems we have today, will not confront our children and their children. This shall be our legacy for generations to come. 8. Today, it is widely acknowledged that the global economy has slowed down. This is particularly the case with emerging markets such as Nigeria. However, despite the weak emerging market growth rates, our domestic security challenges, declining oil prices, and the attendant difficulties in providing foreign exchange to meet market demands, the Nigerian economy grew by 2.84% in the third quarter of 2015. 9. We have, and will continue to implement strategies that will maintain macroeconomic stability and manage the oil price shocks we are experiencing. 10. Upon the inauguration of this administration on 29th May 2015, we engaged key stakeholders from various sectors of our economy and interfaced with the heads of Ministries, Departments and Agencies (MDAs) in order to understand the true state of our nation. What we found prompted us to take certain strategic decisions. 11. On the economy, we injected new leadership at the helm of our revenue generating agencies including the Federal Inland Revenue Service (FIRS), Nigerian National Petroleum Corporation (NNPC), Nigerian Communications Commission (NCC), and the Nigerian Customs Service (NCS). We implemented the Treasury Single Account (TSA) which, so far, has provided greater visibility of Government revenues and cash flows. We intervened to support States to navigate their fiscal challenges by restructuring their commercial bank loans and by providing facilities to enable them to pay salary arrears. 12. We have demonstrated a strong will to fight corruption. I am sure you will agree that the sheer scale of corruption and impunity of the past explains in part, the economic challenges we now face. On these initiatives, and the many more to come, we shall not be deterred. We will pursue the recovery of everything that belongs to the people of Nigeria. No matter where it is hidden. No matter how long it will take. 13. Distinguished and honourable members of the National Assembly, I now present a review of the 2015 Budget. That Budget was based on a benchmark oil price of $53 per barrel, oil production of 2.28 million barrels per day and an exchange rate of N190 to the US$. 14. The projected revenue was N3.45 trillion, with an outlay of N4.49 trillion, implying a deficit of N1.04 trillion. 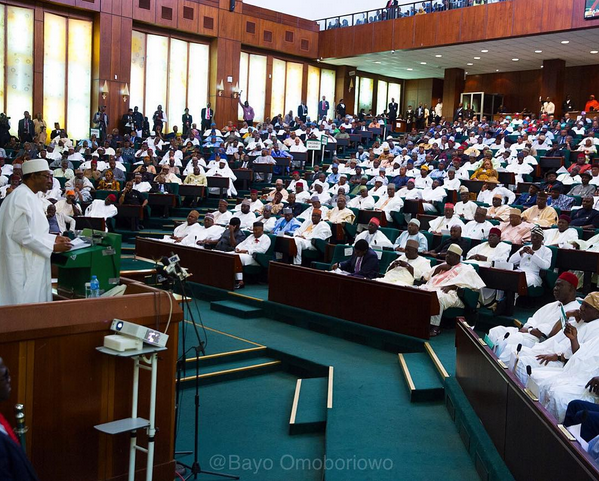 Due largely to under-provisioning by the previous administration for fuel subsidy and the costs required to support the military operations in the North East, the Government had to obtain National Assembly’s approval for a supplementary budget of N575.5 billion. I take this opportunity to thank all members of the National Assembly for the prompt passage of that Bill. 15. After reviewing the trends in the global oil industry, we have set a benchmark price of $38 per barrel and a production estimate of 2.2 million barrels per day for 2016. We have focused on non-oil revenues by broadening our tax base and improving the effectiveness of our revenue collecting agencies. 16. Also, with the full implementation of the Treasury Single Account, we expect significant improvements in the collection and remittance of independent revenues. To further support the drive for increased remittances, we will ensure that all MDAs present their budgets in advance, and remit their operating surpluses as required by section 22 of the Fiscal Responsibility Act. 17. We are determined to ensure that our resources are managed prudently and utilized solely for the public good. To set the proper tone, one of our early decisions was the adoption of a zero based budgeting approach, which ensures that resources are aligned with Government’s priorities and allocated efficiently. This budgeting method, a clear departure from previous budgeting activities, will optimize the impact of public expenditure. 18. In addition to the proper linkage of budgeting to strategic planning, we are enhancing the utilization of the Government Integrated Financial Management Information Systems (GIFMIS) to improve financial management. The recently established Efficiency Unit is working across MDAs to identify and eliminate wasteful spending, duplication and other inefficiencies. We engaged costing experts to scrutinize the 2016 budget proposals. They have already identified certain cost areas that can be centralized for economies to be made. 19. We have directed the extension of the Integrated Personnel Payroll Information System (IPPIS) to all MDAs to reap its full benefits. We will also strengthen the controls over our personnel and pension costs with the imminent introduction of the Continuous Audit Process (CAP). These initiatives will ensure personnel costs are reduced. Our commitment to a lean and cost effective government remains a priority, and the initiatives we are introducing will signal a fundamental change in how Government spends public revenue. 20. The 2016 budget, as outlined, is designed to ensure that we revive our economy, deliver inclusive growth to Nigerians and create a significant number of jobs. 21. We aim to ensure macroeconomic stability by achieving a real GDP growth rate of 4.37% and managing inflation. To achieve this, we will ensure the aligning of fiscal, monetary, trade and industrial policies. 22. As we focus on inclusive growth, we are conscious of the current rate of unemployment and underemployment. This is a challenge we are determined to meet; and this budget is the platform for putting more Nigerians to work. I can assure you that this administration will have a job creation focus in every aspect of the execution of this budget. Nigeria’s job creation drive will be private sector led. We will encourage this by a reduction in tax rates for smaller businesses as well as subsidized funding for priority sectors such as agriculture and solid minerals. 23. As an emergency measure, to address the chronic shortage of teachers in public schools across the country, we also will partner with State and Local Governments to recruit, train and deploy 500,000 unemployed graduates and NCE holders. These graduate teachers will be deployed to primary schools, thereby, enhancing the provision of basic education especially in our rural areas. 24. We also intend to partner with State and Local Governments to provide financial training and loans to market women, traders and artisans, through their cooperative societies. We believe that this segment of our society is not only critical to our plan for growing small businesses, but it is also an important platform to create jobs and provide opportunities for entrepreneurs. 25. Furthermore, through the office of the Vice President, we are working with various development partners to design an implementable and transparent conditional cash transfer program for the poorest and most vulnerable. This program will be implemented in phases. Already, the compilation of registers of the poorest persons is ongoing. In the coming weeks, we will present the full programme, which will include our home-grown public primary school feeding and free education for science, technology and education students in our tertiary institutions. Indeed, this will mark a historic milestone for us as a nation. 26. Distinguished members of the National Assembly, I now present, the 2016 Budget proposals of the Federal Government. Based on the assumptions I presented earlier, we have proposed a budget of N6.08 trillion with a revenue projection of N3.86 trillion resulting in a deficit of N2.22 trillion. 27. The deficit, which is equivalent to 2.16% of Nigeria’s GDP, will take our overall debt profile to 14% of our GDP. This remains well within acceptable fiscal limits. Our deficit will be financed by a combination of domestic borrowing of N984 billion, and foreign borrowing of N900 billion totaling N1.84 trillion. Over the medium term, we expect to increase revenues and reduce overheads, to bring the fiscal deficit down to 1.3% of GDP by 2018. 28. In 2016, oil related revenues are expected to contribute N820 billion. Non-oil revenues, comprising Company Income Tax (CIT), Value Added Tax (VAT), Customs and Excise duties, and Federation Account levies, will contribute N1.45 trillion. Finally, by enforcing strict compliance with the Fiscal Responsibility Act, 2007 and public expenditure reforms in all MDAs, we have projected up to N1.51 trillion from independent revenues. 29. Although we are working to diversify our economy, we will not lose sight of the need to restructure the oil and gas sector which has been marred by corruption and plagued with inefficiencies. Accordingly, I have directed the Petroleum Products Pricing Regulatory Agency (PPPRA) to adjust its pricing template to reflect competitive and market driven components. We believe this can lower input costs and attain efficiency savings that will enable PPPRA to keep the selling price for all marketers of petrol at N87 per liter for now. 30. The current fuel scarcity with long queues at petrol stations all over the country causing social dislocation is very unfortunate. Government profoundly apologizes to Nigerians for this prolonged hardship and misery. It is as a result of market speculators and resistance to change by some stakeholders. Government is working very hard to end these shortages and bring fuel to the pumps all over the country. 31. I have also directed the NNPC to explore alternate funding models that will enable us to honour our obligations in Joint Ventures (JVs) and deep offshore fields. We are confident that these measures can be achieved and will lower the burden that the traditional cash calls have imposed on our budget and cash flows as well as contribute towards shoring up our national reserves. 32. To deliver our development objectives, we have increased the capital expenditure portion of the budget from N557 billion in the 2015 budget to N1.8 trillion, in the 2016 budget. Distinguished and honourable members of the National Assembly, for the first time in many years, capital expenditure will represent 30% of our total budget. In future years we intend to raise the percentage allocation for capital expenditure. 33. This is a fulfillment of our promise to align expenditure to our long-term objectives, and a sign of government’s commitment to sustainable development. This increased capital expenditure commits significant resources to critical sectors such as Works, Power and Housing – N433.4 billion; Transport – N202.0 billion; Special Intervention Programs – N200.0 billion; Defence – N134.6 billion; and Interior – N53.1 billion. These investments in infrastructure and security are meant to support our reforms in the Agriculture, Solid Minerals and other core job creating sectors of our economy. 34. We will invest to safeguard lives and property. 35. We will invest in equipping our farmers with the right tools, technology and techniques. 36. We will invest in empowering and enabling our miners to operate in a safe, secure and humane environment. 37. We will invest in training our youths, through the revival of our technical and vocational institutions, to ensure they are competent enough to seize the opportunities that will arise from this economic revival. 38. Indeed, the future looks bright. And I ask that we all work together to make this vision a reality. The 223% year on year growth in capital expenditure demonstrates our desire to make Nigeria more competitive, and start the journey to deliver sustainable development in our country. 39. In fulfillment of our promise to run a lean government, we have proposed a 9% reduction in non-debt recurrent expenditure, from N2.59 trillion in the 2015 Budget to N2.35 trillion in 2016. Furthermore, we have budgeted N300 billion for Special Intervention Programs, which takes the total amount for non-debt recurrent expenditure to N2.65 trillion. 39. As I mentioned earlier, the Efficiency Unit set up by this Administration together with effective implementation of GIFMIS and IPPIS will drive a reduction of overheads by at least 7%, personnel costs by 8% and other service wide votes by 19%. Distinguished and honourable members, this budget will be executed to provide optimum value by ensuring every naira spent by this Government, counts. 40. We will devote a significant portion of our recurrent expenditure to institutions that provide critical government services. We will spend N369.6 billion in Education; N294.5 billion in Defence; N221.7 billion in Health and N145.3 billion in the Ministry of Interior. This will ensure our teachers, armed forces personnel, doctors, nurses, police men, fire fighters, prison service officers and many more critical service providers are paid competitively and on time. 41. Distinguished and honourable members of the National Assembly, our 2016 borrowings will be principally directed to fund our capital projects. Furthermore, the sum of N113 billion will be set aside for a Sinking Fund towards the retirement of maturing loans; while N1.36 trillion has been provided for foreign and domestic debt service. This calls for prudent management on our part, both of the debt portfolio and the deployment of our hard earned foreign exchange earnings. 42. I am aware of the problems many Nigerians currently have in accessing foreign exchange for their various purposes – from our traders and business operators who rely on imported inputs; to manufacturers needing to import sophisticated equipment and spare parts; to our airlines operators who need foreign exchange to meet their international regulatory obligations; to the financial services sector and capital markets who are key actors in the global arena. 43. These are clearly due to the current inadequacies in the supply of foreign exchange to Nigerians who need it. I am however assured by the Governor of Central Bank that the Bank is currently fine-tuning its foreign exchange management to introduce some flexibility and encourage additional inflow of foreign currency to help ease the pressure. 44. We are carefully assessing our exchange rate regime keeping in mind our willingness to attract foreign investors but at the same time, managing and controlling inflation to level that will not harm the average Nigerians. Nigeria is open for business. But the interest of all Nigerians must be protected. Indeed, tough decisions will have to be made. But this does not necessarily mean increasing the level of pain already being experienced by most Nigerians. 45. So to the investors, business owners and industrialists, we are aware of your pains. To the farmers, traders and entrepreneurs, we also hear you. The status quo cannot continue. The rent seeking will stop. The artificial current demand will end. Our monetary, fiscal and social development policies are aligned. 46. Mr. Senate President, Mr. Speaker, distinguished members of the National Assembly, in spite of the global economic uncertainties; we must remain steadfast in our commitment to steer this country back to greatness. 47. The Nigerian economy needs to move away from dependency on oil. Our growth must be inclusive. Nigerians must be part of the growth story. As a Government, we shall deliver security, jobs and infrastructure. This is the right of all Nigerians. 48. I know many people will say “I have heard this before”. Indeed, trust in Government, due to the abuse and negligence of the past, is at an all-time low. This means we must go back to basics. Our actions will speak for us. My team of dedicated, committed and patriotic Nigerians is well aware of the task ahead and I can assure you that we are taking on the challenge. 49. We will not betray the trust reposed in us. 50. We will welcome and be responsive to your feedback and criticisms. 51. We are here to serve. And indeed, Nigerians will get the service they have longed for and which they rightly deserve. 52. We as a Government cannot do it alone. We will require the support of all civil servants, the organized labour, industry groups, the press and of course, our religious and traditional institutions. This is a call for all of us to stand and serve our country. 53. This Budget represents a major step in delivering a new opportunity for Nigeria. It demonstrates our confident optimism that despite the challenging times, we have the will, resourcefulness and commitment to deliver prosperity to our people. And by the Grace of Almighty God and the sheer will and determination of the Nigerian people, we will come out stronger and more united than ever. 54. Thank you and God bless the Federal Republic of Nigeria.